To be certified as a passive house a dwelling needs to demonstrate compliance with the standard in the PHPP energy model. The rigor of this model is key to the success of passive house in delivering buildings with heating demand as low as promised. There are a number of ways that passive house has closed the “performance gap”– including detailed thermal analysis of junctions and windows, and a high standard of on-site quality assurance – but another factor is the use of conservative estimates for internal heat gains. Traditional energy models have tended to try and emulate the average performance of existing built stock, so in the UK the Sap model includes typical appliance1 and lighting energy use, and a generous allowance for heat loss from hot water systems. Whilst these assumptions ensured hot water and lighting energy use weren’t underestimated, they were then fed into the thermal model as heat sources, and, with a good wodge of insulation, the model showed that a wellinsulated house might not need any heating at all. The form factor of square buildings. Here the houses are all equally compact, given the square floor plans – but inevitably larger houses have a smaller form factor. In practice new houses tend to have the most efficient appliances, and highest standard of hot water cylinder insulation, and this was one factor in the tendency for such houses to have much higher heating bills than predicted. 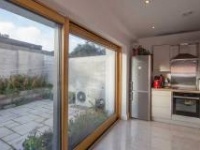 To counter this, PHPP assumes a level of internal heat gains reflecting the most efficient appliances – as you’d hope to find in a genuinely low energy house. It also allows for hidden losses – evaporation from towels needs heat, cold water in WC cisterns also absorbs heat. (Hot water system losses are counted in PHPP as if they were part of the heating system, so that the design of hot water system doesn’t give you any leeway in specifying the building insulation levels.) Combining these gains and losses resulted in a fixed internal gains figure of 2.1 W/m2, as a continuous average – so a 100 sqm house is assumed to have a continuous 210 watts of internal heat gain when averaged across the heating season. In Sap the figure would be 3 times that, which is enough to make a house designed to passive house look like it has no heating demand at all 2. In fact passive house buildings do have heating demand, and it seems that the PHPP internal heat gains figure is a good approximation in most cases. However we recently came to help design a retirement bungalow for a couple, to be built in the garden of their existing house. Planning permission didn’t allow this to be sold separately so there was no incentive to build bigger than necessary – nor was there the money. The house was a bungalow of 45 sqm with ideal orientation and southerly aspect – but with passive house insulation, windows and MVHR the heating demand was coming out in PHPP at around 40kWh/m2/a, to the disappointment of the client. Surely we can make that a passive house, we thought – and on paper we managed – extra insulation, better airtightness, lower eaves, but crucially we also had to factor in a lot more south facing glazing. We concluded that really, this wasn’t a good idea. When we looked at what the heat gain would be from our two occupants, their cooking and washing, and their modest low energy TV and fridge, it was clear that the place would overheat all year round. 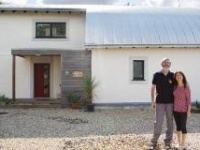 Our advice was that the passive house standard was the wrong standard for this size of house. 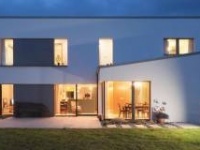 As passive house designers this troubled us – obviously we would like to be recommending passive house as the preferred solution for all sizes of house. We realised there must be an error in how PHPP treated small dwellings and wanted to find out what it was, and how to fix it. One problem familiar to passive house designers is the form factor of small buildings. Basic geometry shows that a small building has a higher external area per square meter of floor area than a larger building, and so the heat loss per sqm of floor area is also higher (though the total heat loss is of course lower). But another issue was the internal heat gain assumptions –two people in a 45 sqm house at standard occupancy would provide an average of 2 W/m2 just with body heat. In fact since they’d mostly be at home during the day the gains could easily be 3 W/m2, which is more than the standard assumption for total gains in PHPP before we even consider appliances, cooking and so forth. 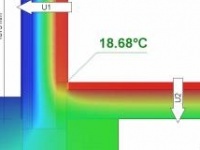 But this ultra small house might be an extreme case, so for the basis of a paper presented to the 2014 International Passive House Conference in Aachen we carried out a general analysis of the internal heat gain assumptions in passive house design3. -There’s a basic, fixed, internal gain per dwelling – think of fridges and freezers, and things like heating controls. -And then there’s a heat gain which is taken to be proportional to the number of occupants – laundry, dishwashing, and also cooking, TV etc, and lighting. -Finally PHPP actually assumes very little heat gain is directly related to floor area – just the pump power for the heating system (though we think lighting energy is in part dependent on floor area too). So how does PHPP get to a fixed internal gain figure of 2.1 W/m2? Firstly one has to assume that the number of occupants is determined by the floor area – PHPP needs a method that works for a house without knowing how many people will live there – and when we assume one personper 35 sqm the occupant dependent gains come out at about 1.5 W/m2. Then for a house of around 150 sqm the fixed gains make up the remainder and 2.1 W/m2 looks like a good figure. But we looked at how the internal heat gain/m2 varied according to house size, when considered as a combination of the fixed gains (such as that fridge) and the variable ones (how many people) as estimated in the PHPP “actual” gains model. What is interesting is that the curve looks quite similar to the form factor one: small houses have high heat loss per sqm but they also have high internal gains per sqm. Could these two variables cancel each other out? Next we looked at the assumptions of occupancy. In fact we’ve seen a whole range of different occupant densities in passive house dwellings – a family of four in an 80 sqm house, or a couple in a 160 sqm house – overall the range we saw was from 20m2/person to 140m2/person. We don’t know if our experience is representative, but in any event it’s impossible to predict how many people will really live in a house of a given size. However the model needs a figure for occupancy to base calculations on, so PHPP takes the simplest possible option – a flat rate of 35m2/person. We knew that SAP had a more nuanced approach, but when we plugged the SAP formula into our spreadsheet we thought we’d made a mistake – the total occupancy seemed to top out at about three people per house, however big the house. In fact this formula was carefully considered and reflects the reality of the housing stock based on surveys of 32,000 households: although the smallest dwellings (flats, usually) can only fit one or two people, any larger and the occupancy is basically one family unit – averaging about three people. We used this empirically derived formula for occupancy in the PHPP “actual” internal heat gains calculation, and modelled the heating demand of a simple house across a wide range of floor areas with fixed U-values. Remarkably the curve came out almost flat – whatever size house we looked at, with sizesensitive internal heat gains, and using “passive house components” the annual heating demand was around 15kWh/m2/a This included larger houses which were showing a result of less than 15 kWh/m2/a heating demand when assessed with the standard 2.1 W/m2 internal heat gains figure. Of course we don’t want to be working out exactly which model of fridge we can fit this year, or worrying whether UK housing occupancy is different than in other countries (not much, it turns out according to the data), so we came up with the simplest curve fit we could – an easyto- use equation of internal heat gains = 71x(floor area)-0.73 W/m2. The two variables can be tweaked a bit, this was the best fit for default PHPP electrical use assumptions for floor areas up to 200 sqm. In fact these assumptions have no allowance for all the little always- on loads in a house– controls, smoke alarms, modem, and numerous items on one watt standby – these typically add to up 40- 50W but even with the best practice we can’t get this below 20W. Including this small addition shifts the curve slightly to IHG = 86x(floor area)-0.75 W/m2, which we think reflects reality pretty well. Clearly one could spend plenty of time arguing the finer points of minimising household power use, but this basic equation gives the general shape. So that’s great we think, problem solved. But what if only one person lives in a 90m2 house, not the average 2.6 (the same according to SAP and PHPP)? Will they be too cold, or suffer from excessive heating bills? In fact the base heat gain from running a one-person household – the fridge/freezer, modem, smoke alarm, controls, standby loads predominate, accounting for the majority. And then what happens if electrical efficiency improves further, as we hope it will – 5W LED bulbs light a whole room, fridges and hot water cylinders have vacuum insulation, and every appliance has a zero-watt standby consumption? Body heat already makes up a useful fraction of the internal gains, so that shouldn’t disappear, and if our annual electricity bills are halved at the expense of a small increase in heating demand then that should be an acceptable price to pay. Going back to our little 45 sqm house, with our new equation we now assume the internal heat gains will be 4.5 W/m2 instead of 2.1. How will that fare if the gains aren’t as high as our initial assumptions? With just one occupant, eating a raw food diet straight from the garden, the house may have lost 2 W/m2 of internal heat gains but spread over just 45m2 that’s only a 90 watts shortfall – just a few hundred kWh over the heating season. What looks like a big deficit per square metre is not so bad when the number of square metres is very low. So this is our simple proposal – a new equation for estimating the internal heat gains in PHPP when designing a passive house. It happens to solve the “small house problem” but that doesn’t mean it’s a cheat – it’s just a happy consequence of looking more carefully at the model, and at reality. What is really interesting though is that this new model shows that the basics of building a passive house dwelling are more constant than we thought – 300mm of insulation, triple-glazing, MVHR, built with a compact form, thermal bridge-free and airtight, of course. But note that given the use and occupancy of any individual dwelling is so variable, we do not propose that we base the internal heat gains on actual appliance energy use, but instead recognise that the make-up of household energy use and occupant density leads to a trend for internal heat gains to follow a non linear pattern with respect to dwelling size. By using a simple formula which matches this trend for the average occupancy rate we can maintain the existing passive house fabric efficiency requirements of the standard in medium size dwellings and also resolve the conundrum of how to make passive houses smaller, and hence lower energy consumers, without needing abnormally high fabric standards. A complicated problem has quite a simple solution. 1 Ed. – This differs from the Irish national methodology, Deap, which doesn’t count energy used by appliances. Ironically Deap was designed based on Sap, which originally didn’t include appliance use, but was extended to include appliances in 2007 in preparation for HM Treasury’s Stamp duty land tax relief for new zero carbon homes. PHPP aficionados will now be asking: how does this internal gains formula affect heat load (the 10W/m2 alternative certification criterion) and the functional definition of passive house (the ability to heat with the ventilation air)? We decided to look at this in our simplified model. The internal gains assumptions for this case exclude those associated with occupancy – with a minimal heating system (such as air heating) you need to be able to keep the house warm when away on a winter holiday, because otherwise it will take too long to bring the house up to a comfortable temperature. The standard internal gains figure in PHPP reflects this, being lower at 1.6 W/m2. We realised we could easily modify our model to work out the size dependent gains for an unoccupied house by simply taking the fixed gains, and omitting the occupancy dependent ones – the refrigeration, and standby loads stay, whereas the cooking, washing, lighting go, as do the losses from incoming cold water and evaporation. Our analysis didn’t take detailed account of the design weather conditions or solar gain – but as you would expect, the higher internal gains per square metre again counteract the higher heat loss per square metre of floor, though in this “worst case” of lowest gains and highest losses (an empty house over the coldest days of the year) larger dwellings do tend to benefit more from their better form factor. Interestingly when we look at the “functional definition” and include the heat transportable by the ventilation air – with ventilation rate calculated to suit the realistic average occupancy levels according to the BRE’s research – we see a different picture. Small houses tend to be more densely occupied so our ventilation rate is above 0.4 air changes per hour for dwellings smaller than 60 sqm. For those larger than 120 sqm the rate is determined by the 0.3 air changes per hour backstop ventilation rate rather than the number of people living in the house. This means that the heat input per metre square from the ventilation air is higher in a small house than a large one, more than making up for the heat load disadvantage. Now we see that it is really quite easy to build a small passive house according to the functional definition, but rather harder to build a large one.